This very lovely bottle of Glenrothes 1995 (15 or 16 years old depending on you choose to interpret the label) was a gift from Danielle of Exposure (thanks, Danielle). I wasn't able to make the Cocktail World event where she was pouring the new Glenrothes expressions (it was on Mother's Day for heaven's sake). Very kindly she sent me this bottle and the Suntory samples for review. In the context of my tastings of the Select Reserve, 1998, and 1985 expressions last week, the 1995 has emerged as something of a tie breaker for me. 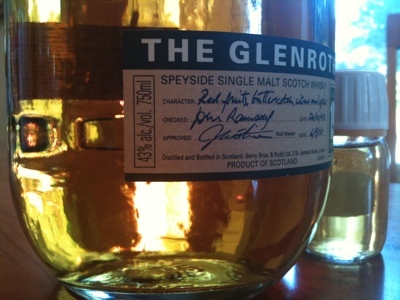 While the Select Reserve had aspects of the august and elegant presentation that typifies the Glenrothes flavor profile as well as some terrific youthful fruit basket notes, it was marred by a young rough aspect and some off flavors. The 1985 was glorious with dried fruits and old books. The 1998 had some lovely aspects of both but had an acidity and some admittedly extremely subtle sulfur notes that affected my enjoyment. I'm not normally particularly sensitive to sulfur notes, but in this case the combination with the acidity took the 1998 from apricot/citrus into balsamic which didn't ruin the show but took things down a notch for me. The 1979 expression I drank in the 90s was quite good, but not an overwhelming success like the 1985 is. Thus, if the 1995 was a lovely dram I would actively seek out I would come away with the impression that Glenrothes was a brand to pursue. If it was a disappointment then the glory of the 1985 might appear as more of a fluke and I might be tempted to look elsewhere in the future. As it turns out, I had an extremely hard time with this review, perhaps as a result of the pressure latent in this context. I ended up drinking about 1/3rd of the bottle over the course of the entire week (yes, I know, whisky blogging is a brutal business). My impressions seemed to veer wildly. In some tasting sessions the 1995 the flavor profile bothered me. In others it delighted me. Is Glenrothes Vintage 1995 a 16 year old or a 15 year old? I don't know. 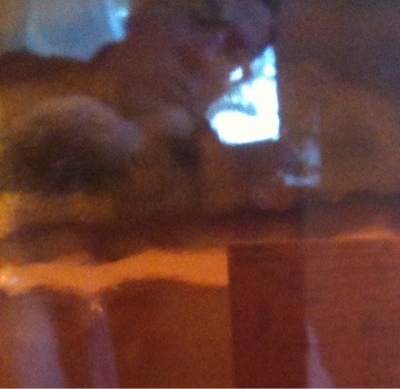 The big green square says "Distilled in 1995 Bottled in 2011" which sounds like 16 years. The handwritten dates say "checked" October 26, 1995 and "approved" September 6, 2010 which sounds like just under 15 years. It's not clear from the label. Doesn't particularly matter to me - but it's an interesting question for a bar tender or brand ambassador. Color: very light amber with abundant gold tones. With a splash of water it becomes rich old gold. Nose: vanilla, apricot, malted milk, touch of iodine, goji berries. There's also a distinctive sweet-sour acidic note that runs like a common thread through all of the vintage Glenrothes expressions. In the 1998 it had a balsamic aspect. Here and in the 1985 it turns up like dried apricots (more convincingly in the '85. In the '95 this note is little bit like wine.) A bit of water smooths and sweetens the nose a bit, emphasizing honey and grain. Entry is off-dry, yet with clear flavors of honeyed grain with a nice creaminess: a filigree of barleycorn, honeycomb, and apricot Danish pastry. There's some nice woody heat at mid-palate, with a waft of vanilla perfume, some red fruits, and old citrus glow. At the turn to the finish there is a relative decline in flavor density that almost escapes notice. The finish is medium-long with plenty of oak influence sandalwood spice and drying tannins. The slightly lean aspect of the middle comes off as elegant restraint, with a burst of spices balancing the sweet lacy opening and the robust wooded finish. I get the feeling that the creaminess would be enhanced and the mid-palate improved if they skipped the chill-filtering (like Glen Garioch). But this is a quibble, the flavor signature is quite enjoyable and remarkably similar to the 1979 16 year old version I enjoyed a decade and a half ago. Adding several drops of water to another dram and allowing half an hour for full air and time for integration works a beguiling transformation. Sprightly flavor notes of Speyside fruit basket appear on the entry. The apricot note takes on a lovely light lemon flavor on the palate. Sweetness and creaminess is enhanced along with floral vanilla and caramel notes, producing a citrus and butterscotch effect. There are still red fruits in the mid-palate, and plenty of oak on the finish, coming off as a slightly bitter note after the sweeter opening before devolving into a lightly fruity and post-tannin squeaky afterglow. The bit of water fills in the flavor presentation, paradoxically making the whole thing a bit richer and fuller. This has become my preferred way of taking Glenrothes 1995. 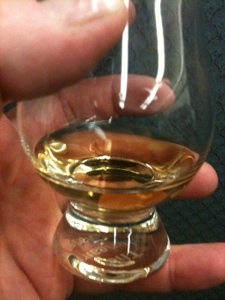 Indeed, I'd go so far as saying that Glenrothes 1995 is a convincing delight when taken this way. Creamy, sweet with beehive and grain flavors, with a mid-palate that tends towards and elegantly lean and dry profile and plenty of oak on the finish; this constellation of flavor elements is quite consistent across the line, making for a clear family resemblance. The vinous acid note shows as quince in the Select, Balsalmic vinegar in the 1998, apricot Danish in the 1995 and dried apricots in the 1985. The honeyed barley, fruits, elegant off-dry presentation, lean middle, and rich oak in the finish are all across the line. Water ups the vanilla and sweet. 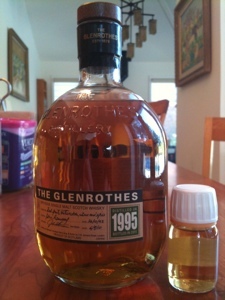 In a number of conversations I have found this Glenrothes flavor profile has a polarizing effect. Some folks don't like; others like it a great deal. I'm used to polarization like this in powerful flavor profiles, like peat monsters and sherry bombs, but not in fairly lightly sherried fruity Speyside dram. Yet it is so. For example Tim Read of Scotch And Ice Cream reported on Twitter that he hadn't found a Glenrothes expression he really loved, even after a fairly extensive exploration of the line. Gal Granov of Whisky Israel, by contrast, liked this expression a good deal, and the 1985 as well. I suspect its the peculiar arrangement of the flavor signature with the acids that can read as sourness or as lovely fruits depending on how they are aligning. In the end I'm coming down on the side of Gal here. 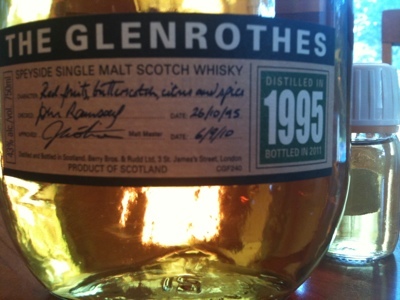 Glenrothes is nice stuff - particularly when it's mature and when it has aired for a good long period in the glass. It takes aging very well in the wood and the older expressions have a noble quality. Very enjoyable review, thanks =) I've felt since my own tasting of the Select Reserve/1998/1985 I should spend a little more time with Glenrothes. Thanks so much, Padraic. Hopefully someday we'll figure out how to dram it together. It's definitely a Spey with a clear identity. I'm going to keep it on my radar. I'd be very curious to try a single cask / small batch version that was non chill filtered. I hope that Berry Bros. does their thing with it. I've struggled with the "approved" and "bottled" dates myself, especially since you can find different versions of the same vintage - all details will be the same except for the bottling year. I asked this question when visiting the distillery last month. First the master blender spends a couple of weeks working on mixture of casks that have a certain character. In the end a specific mixture of casks is approved, which is then bottled. Sometimes, depending on the number of casks used, they keep part of a batch and store it in "dead" wood, i.e. casks that have been used so many times that the wood influence during the extra storage period will be (virtually) non-existing or at least quite irrelevant. So when you find the same vintage with different bottling years, the recipe and the casks used will have been the same but they are bottled at different moments in time, with theoretically the same result. 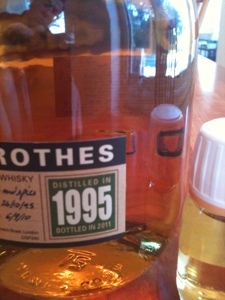 The actual bottling date and age can't be deducted from the label, but of course this is part of The Glenrothes' unique concept of working with vintages instead of age expressions. Ruben, thanks so much for shedding light on this somewhat confusing issue (vintage dating and how old the expressions of Glenrothes are). The idea that vintages are vatted and then bottled at various times makes a lot of sense and explains how a single vintage year can be bottled in different years. I'll stop fussing about it and just go with it. It's one of the best and most comprehensive whisky blogs out there. I use it extensively. Thanks so much for coming by!